At Baa Baa Brighouse, we aim is to invest in and support Yorkshire sheep farming and the highly skilled, independent small businesses that thrive as a result. That’s why we’re committed to using wool in at least 75% of the garments we produce and yarn that we stock, in particular Yorkshire’s own breed, Bluefaced Leicester. Art Viva manufacture handmade wooden knitting needles in a range of vintage colours and varying lengths. The needles are made from Tasmanian oak sourced from sustainable plantations. Each needle is individually hand crafted and finished using natural, organic oils giving a smooth finish without being slippery. The beads that top the needles are all hand painted using premium quality, non toxic water based paint. We supply beautifully ornate knitting needles and crochet hooks with decoratively carved ends from Brittany. Made with Californian birch, they are smooth and warm to the touch. Birch won’t drain heat from sensitive fingers the way aluminum and plastic needles and hooks do. The warmth and smoothness of hardwood nurtures sensitive fingers and provides natural strength and consistency for a lasting product. The birch wood used is completely environmentally friendly, being renewable, biodegradable and most importantly durable. Baa baa Brighouse stocks a range of Rachel Coopey’s popular Socks Yeah! 4 ply knitting yarn in a range of natural shades. Erika is a well known knitwear designer and author. She has created a collection of quality, soft hand knitting yarns in gorgeous muted colours reminiscent of the Yorkshire landscape. Her wool is spun from British flocks and made entirely in Yorkshire – now at Thomas B. Ramsden’s in Leeds. 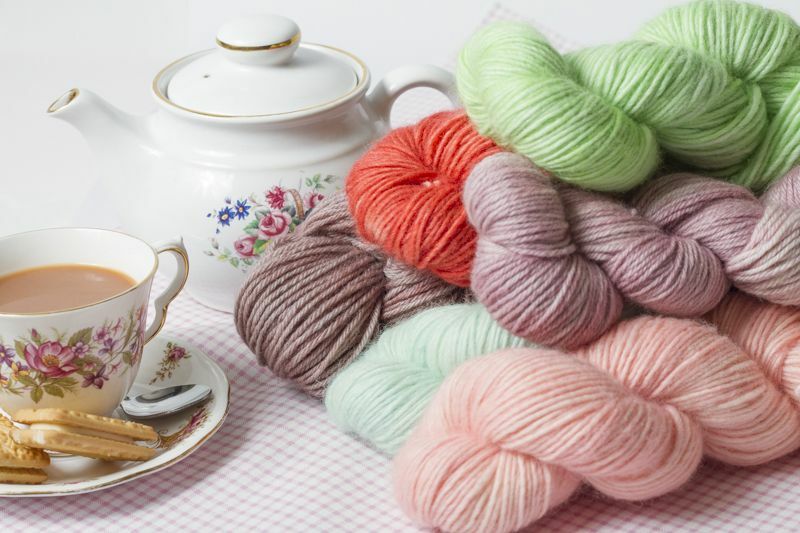 Baa Baa Brighouse stocks British Blue 100 but also offers alternatives to wool with Erika’s Gossypium Cotton and Studio Linen along with a selection of supporting patterns. Fiona Wardingley is a talented Brighouse crafter, stationer and is also the owner of Knitted for Ewe Designs. She has designed a number of patterns for us. Fiona also supplies us with our Baa Baa sheep earings and brooches. We’re incredibly proud to be a Rowan stockist – a real Yorkshire homegrown yarn brand based only a few miles away from Baa Baa Brighouse in Huddersfield. At first, we were attracted to Rowan’s British Sheep Breeds yarn – continuing our ethos of supporting British sheep farming and wherever possible, yarn that has a strong connection with Yorkshire but as Rowan’s core yarns were reorganised we expanded our range to include Rowan Super Fine Merino 4 Ply, Rowan Fine Lace, Rowan Felted Tweed, Rowan Kidsilk Haze, Rowan Summerlite 4 Ply, Rowan Hemp Tweed, Rowan Alpaca Merino DK, Rowan Baby Merino Silk DK, Rowan Big Wool and Rowan Valley Tweed – all made with natural fibres, but with one or two blends offering beautiful alternatives to wool. A range of supporting pattern books is also available. West Yorkshire Spinners, formed in 1997, is one of the few remaining worsted spinning companies left in the UK. Based in Keighley, they source all of their own raw materials, ensuring that the quality of the yarn they produce is consistently high – something for which I will vouch, having used their Signature 4 Ply in a range of my own projects. Their beautiful muted Spice Rack, vibrant Sweet Shop range, timeless Country Birds range, fun self-striping Cocktail range and delicate Florist range are available to buy here at Baa Baa Brighouse along with supporting patterns. We also stock a selection of their Illustrious Naturals DK yarn and The Croft Shetland Tweed Aran.